Yesterday was Pioneer Day (at least for those in Utah) and i hope it was great for everyone! It was also my 10k run. I ran it with Kevin and his dad, Chad. It started at Research Park up at the University of Utah, went down through the U, through the avenues, and finished at Liberty Park on 900 S. Kevin's mom, Jeannine, and brother, Casey, were there at the finish to cheer us on, so that was really cool of them to come down. We finished it in under an hour, which is definitely my personal best. I managed to cut a half hour off of my previous best time of an hour and a half. So i was pretty happy with that. However, my body definitely isn't... I am SO SORE! I am as sore as i was after my first runs this season. I can hardly walk! I look like a 90 year old woman as far as walking is concerned. The reason i am so sore is because we ran it at a way faster pace than i am used to. Two things happened while i was running that have never happened to me before. My fingers swelled up so big! They were like little sausages sticking out of my hand. So i must have been a little dehydrated or something. The second thing is, I'm pretty sure i had some sport-induced asthma start. About a half mile before the finish, i really felt like i couldn't get enough air and all of a sudden my throat felt as if it were literally closing up. It felt like i was trying to breath through a straw! 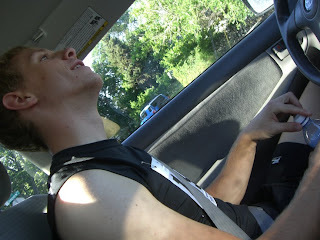 I could hardly breathe, let alone talk, so it took me about 30 seconds to tell Kevin what was wrong. Every time i breathed in, it was loud and very wheezy. It scared me way bad! The finish line was in sight though, and so i just kept going and finished. My throat started loosening up after i finished and slowed down. I will have to be very careful about that i guess. Other than that, it was fun and i can't wait to do another run again! 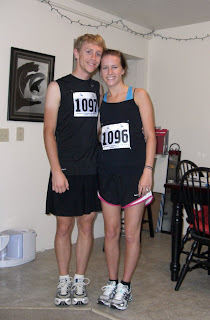 Before the Run- excited to start! 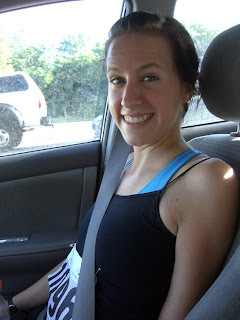 After the run- excited to be done! My parents and Colby and Logan came up yesterday afternoon and we went out to eat. That was fun to get to see them :) Last night we went and saw "The Dark Knight" for the second time. We went with Kevin's family. I pretty much LOVE everything about that movie! I think it's genius! The first time, Kevin and I saw it in the IMAX theater, which was amazing. I think Heath Ledger's performance as the Joker is brilliant. I don't think anyone could have done it better! It's a shame he's not around anymore because this would have been his crowning role. Me and Kevin want to go watch it a third time :) After the movie, we had a little BBQ at the Briggs' house. It was fun. it's about time you started a blog. i love these things! they are so fun and very addicting. 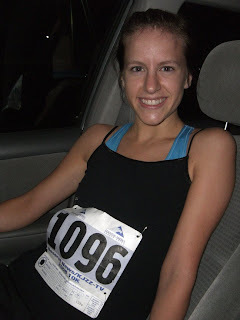 way to go on your first 10k that is awesome! You guys are so dang cute! Congrats on the 10K...that's incredible and a great time! I 'm so proud of you!